The importance of agriculture in the Indian economy, in terms of providing livelihood opportunities to 650 million of its population and raw material for a large number of its industries, cannot be overstated. For the Indian economy to maintain its growth momentum on a sustainable basis, the agriculture sector would have to play a more important role than it has in recent years. 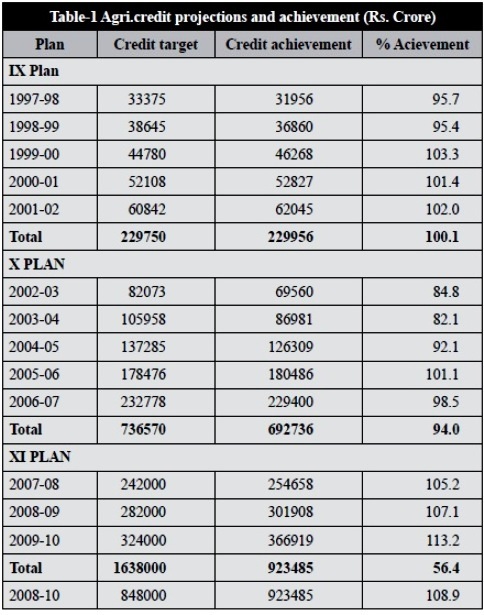 The actual growth in the agriculture sector during the first four years of the 10th Five Year Plan has averaged only about 2% per annum as against 4% per annum as envisaged during the Plan period (2002-07). While the share of agriculture GDP in the overall GDP has declined from around 35% in 1980-81 to around 18% at present, the fall in the proportion of population dependent on the sector has been insignificant from 70% to 66% only. The rapidly worsening ratio between the rural per capita income from farm and non-farm sectors is causing serious concern. While a majority of the workforce is still dependent on agriculture, the GDP growth rates in agriculture is marginally above the rate of growth of population, in contrast to the high growth in the non-agricultural sector. Secondly, growth has been uneven across regions and crops. Thus, despite achieving self-sufficiency in food grains production at the national level and technological advancements in agriculture, starvation deaths and suicides continue to plague a large section of the farming community in different parts of the country. The decline in the share of the agricultural sector’s capital formation in GDP from 2.2% in the late 1990s to 1.7% in 2004-05 is a matter of concern. The decline in profitability of agriculture during the nineties by 14.2% could be one of the major reasons for lack of growth in the private sector investment in agriculture. Investment in irrigation, land development, watershed development, agricultural marketing infrastructure and rural roads are increasing agricultural productivity and incomes. Revival of the cooperative credit institutions through legal and institutional reforms as per Vaidyanathan Committee recommendations, and financial support is expected to improve the flow of credit to the agriculture sector and increase investment in the sector. appreciation of agriculture as a very important component of the economy. The need is for low cost funds for NABARD to reduce the cost of finance for farmers and ensure that farmers access credit at 4% (as recommended by the National Commission on Farmers, headed by Dr.M. S. Swaminathan in 2007). Farmers will be unable to reduce input costs for seeds/ fertilizers/pesticides and other essential inputs like water, labour etc. The only way is to reduce cost of credit by giving this in a subsidized mode. Agricultural credit targets since 1997-98 and the actual achievements, are set out in Table-1. Though agricultural credit data on paper is impressive, the small and marginal farmers are unable to access credit easily. There is excessive lending to the agricultural sector in metropolitan areas indicating that indirect lending for agriculture has gone up for activities such as warehouses, cold storages, irrigation, rural electrification etc. There is evidence that the same set of credit worthy farmers are availing of credit with new borrowers still struggling to secure credit. The GOI’s loan waiver schemes and concessional interest schemes tend to benefit farmers who have access to bank credit and have further enhanced flow of credit to the non-defaulting farmers! These are typically large and medium farmers with multiple income sources, not relying wholly on risk-prone crop credit. Small and marginal farmers should be helped to liberate themselves from the stranglehold of moneylenders and should be given priority for accessing low cost credit through KCC mechanism. Farmers suicides have also come down drastically especially among cotton growers, largely due to the excellent pest free transgenic Bt cotton seeds which have reduced crop failures and not so much due to improved access to institutional finance. The recent crisis in micro finance would only reduce accessibility to credit sources for the small and marginal farmers. If financial inclusion is relevant, the Central/State Governments must ensure that all farmers especially the small and marginal ones, get priority access to cheap farm loans and not the better-off farmers who are able to access institutional credit more easily. Though NABARD has been striving to access low-cost funds for reducing the cost of agricultural credit, its ability to meet sectoral challenges and direction of credit to desired section of the agriculture sector is increasingly being questioned. A quick review of the financial support from NABARD for the rural agricultural sector reveals that refinances to agriculture as a % of the ground level credit to agriculture since the creation of NABARD in 1982, rose from 23% to 51% in 1989-90 and thereafter has declined to 10% in 2009-10. Thus, NABARD’s refinance is now inconsequential to the agriculture sector. The proportion of NABARD’s refinance for minor irrigation which was 52% in 1982-83 has reduced to less than 5% in 2009-10 while other sectors like Dairy Development, Animal Husbandry, Forestry, Fisheries together would account for less than12% of the refinance flow. · Social security and risk mitigation for the marginalized. Accordingly, NABARD has experimented and successfully demonstrated various approaches in addressing the key issues indicated above. Sustainable livelihood opportunities or integrated development of tribal communities primarily through orchard based farming systems. A typical wadi project covers 1000 families in a cluster of 20-25 tribal hamlets with a support of Rs.4 crores @ Rs.40,000 per family over 7-8 years. Plantation activity is taken up in the first three years and each family is supported for 5 years for orchard development. Wadi projects have benefitted 1.7 lakh tribal families and has a corpus of Rs.1150 crore. Since 1992, development of micro watersheds for sustainable production systems has been taken up in different watershed programmes. A Watershed Fund with a corpus of Rs.12103 crore has been built up. Over 1915 projects were sanctioned covering 15-32 lakh farmers over 3030 villages. The participatory approach includes voluntary labour (shramdan) and is an integral part of the programme with emphasis on self help, environmental sustainability and poverty alleviation, all supervised by the village Watershed Committees. Though not supported by ICAR, this package of practices developed in Madagascar 25 years ago, is being actively supported by State Governments and farmers in Tamil Nadu, Andhra Pradesh and Tripura and sporadically in other areas. Intensive training and pilot projects have been initiated. This system is a boon for small and marginal farmers as it reduces input costs of seeds by 60% and water irrigation costs by 40%, reduces fertilizer costs by 30% and enhances production by 35% over the traditional transplanted rice. Research for similar water saving crop techniques in barley, wheat and sugarcane have been initiated with promising results. With poor germination rates of 55-60% and poor seed replacement rate of less than 15% the quality of seeds available to the farmer, is the single most important determent of farm productivity. For localized seed production and availability of quality seeds, farmers need to retain control over the availability, distribution and cost of quality seeds on a localized basis. This will reduce cost of seeds and ensure better seed replacement, eliminating transport costs etc. Farmers must insist on seed germination rates of 90%. · The Lead Bank Scheme,1970 needs to be reviewed and the RBI’s attempts to revise the scheme in 2010, too may not meet actual ground level requirements. Also financial inclusion for farmers by ensuring KCC’s for all farmers over a 5 year crop cycle, should be implemented. Rural employment in agri processing, off-farm and nonfarm activities which enable the unemployed rural youth to participate, has to be taken up on a priority mode. The National Rural Livelihoods Mission of the MoRD needs to be strongly supported by all banks including NABARD and RBI. Over 55,000 Farmers Clubs have been started by NABARD with the support of various banks covering 1.05 lakh farmers in 587 districts, as against a target of 1 lakh Farmers Clubs by 2012. These clubs ensure technology transfer mechanism, credit counseling, market advocacy besides giving training, visits to farms, SHG linkage with banks/universities/technical inputs and help in credit discipline including loan recovery, formation of Joint Liability Groups of farmers for access to farm credit. Farmers Association are also being nurtured so that groups of Farmers Clubs can play the role of facilitators for produce grading, costing, packaging and transportation so that the aggregators role can be played by them. This will enable farmers to enhance their financial margins which today is enjoyed by middlemen. Credit E-chaupal (M.P., Chattisgarh etc) for market prices and rates. India achieved self-sufficiency in food grains in the 1970’s and has sustained it since then. Yet the concerns about the low per capita food energy intake and non fulfilment of basic nutritional requirements of a large percentage of the population have kept the issue on food security alive even today. Apart from the issues related to agricultural credit flow discussed above, the country today also has to contend with issues like lack of adequate storage for food grains, degradation of natural resources and climate change and its attendant problems. All these problems have to be attended to comprehensibly if agricultural development is to be carried out on a sustainable basis.